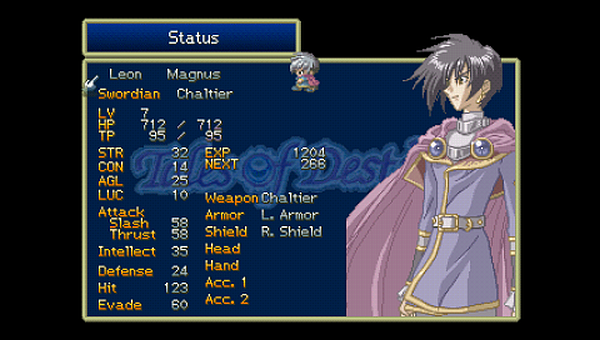 I hadn’t played a nice, old-school RPG in a while, and I hadn’t actually even played a Tales game before! 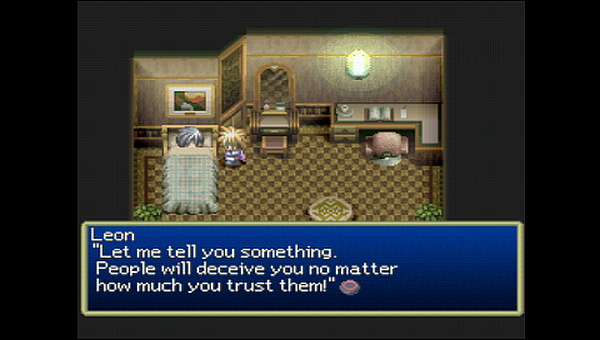 Enter Tales of Destiny, a game I had set my sights on over 10 years ago, but simply hadn’t got to until now. It is quite remarkable just how clichéd this game is… It’s old-school RPG to the bone. But sometimes that’s not such a bad thing. Sometimes, you just want to wander a world in a medieval setting, playing a painfully honest hero with a strong sense of justice, one who always, without fail, does the right thing. Someone who starts small and insignificant, but grows through the adventure, recruiting powerful allies, and becoming even more powerful than them during the journey. And at the end, naturally, you will save the world. 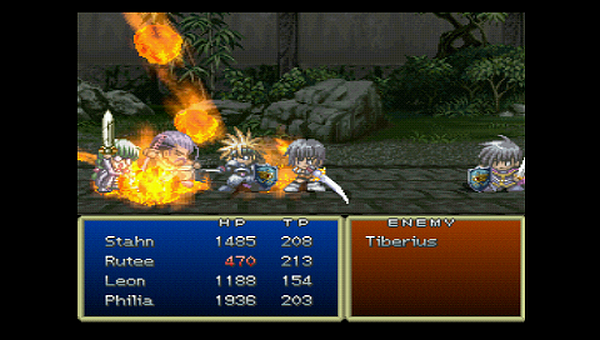 Tales of Destiny has an interesting action battle system, which plays a bit like a 2D fighter. Fortunately, you can still pause the action to use magic, items, etc. In light of everything I wrote above, the battle system saves it from being a completely generic RPG. There are some fun mini-games and side quests, too. The story also has some fascinating nuances, and there’s some fun to be had from the mostly lighthearted character interactions, but do not expect anything particularly deep. 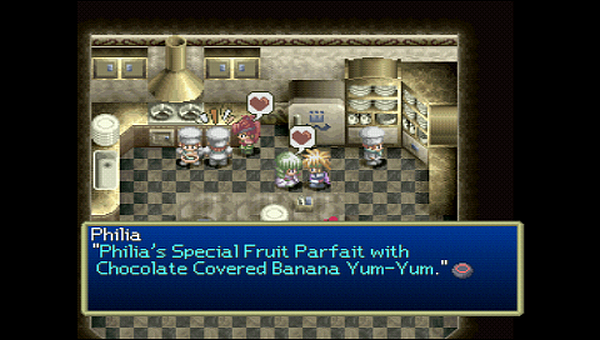 Tales of Destiny is all about the innocent joy of the JRPG of the 90s. 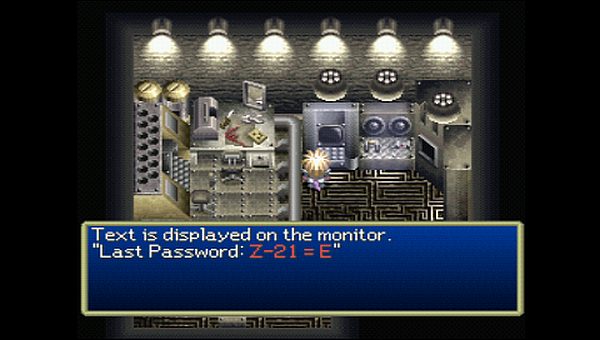 Despite being on the PlayStation, in terms of looks as well as mechanics and plot, it’s a lot like an SNES RPG. All screenshots in the review have been taken by me. The story starts with Stahn, our pure-hearted protagonist, caught as a stowaway on the remarkable airship Draconis, shaped like a dragon as its name suggests. Suddenly, after he is busted and taken to the captain, monsters attack the airship… Amidst the trouble, Stahn stumbles upon a sword… that talks. 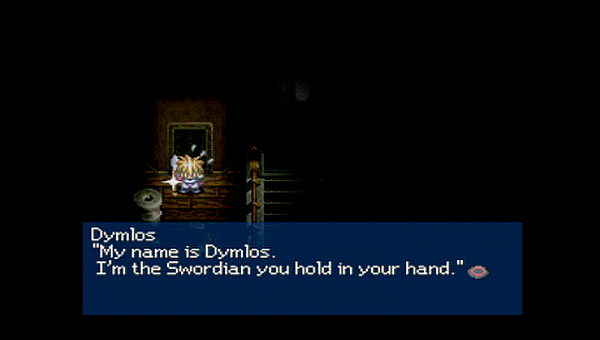 It is the Swordian (sentient sword) Dymlos, who explains with what would have been a very serious face, if swords had faces, that Stahn is the chosen one who will wield him and save the world. 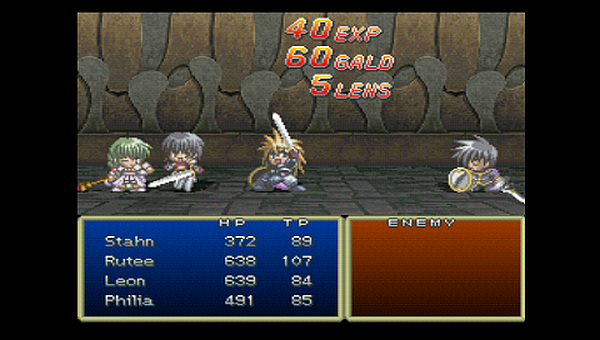 And, on top of that, Stahn happens to be a master swordsman. He fights the monsters and pretty much singlehandedly repeals their attack… But not well enough to stop the Draconis from crashing onto the ground. Stahn can’t believe his luck as he survives the crash… And that’s where his quest begins. 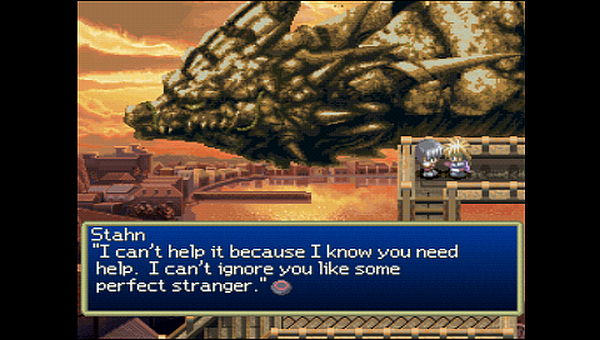 Like it usually happens in RPGs, it doesn’t take too long for Stahn to meet friends and discover a goal worth fighting for. And the story continues in that well-trodden path we are so familiar with. There is a degree of mystery, interesting locations and many humourous moments, but the core story remains quite basic, without real intrigue or many twists. It is a pleasant story, but one a gamer has been through numerous times. 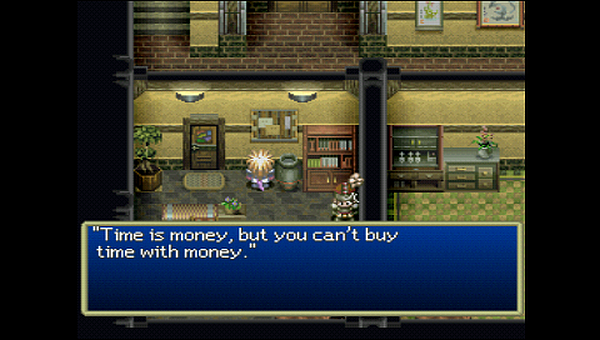 It’s one of the things that makes Tales of Destiny a very recreational game, in comparison to other games. Still, the world that the story takes place in is fascinating. There is an icy region, a hot sandy land, a standard RPG kingdom, a Japan-like archipelago, modern cities, small villages, and even a town built in a junkyard. Some things don’t make a whole lot of sense geographically, like the snowy region being more or less in the middle and slightly south part of the map, but it’s something one can overlook. There have been many wars, from the Aeth’er Wars in ancient times we can hear about in legend, to more recent strifes between the currently established nations – Seinegald, Phandaria, Calvalese, etc. The citizens of these nations tend to have strong national identity (Calvalese people tend to strongly distrust foreigners, for instance), and there are differences in their mentalities and way of living that are interesting. 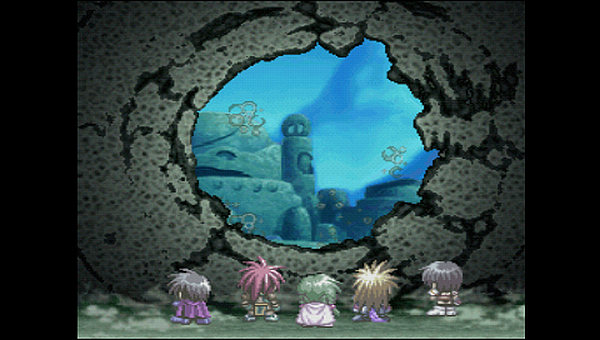 The cast and interactions between its members is one of the strongest points of Tales of Destiny. 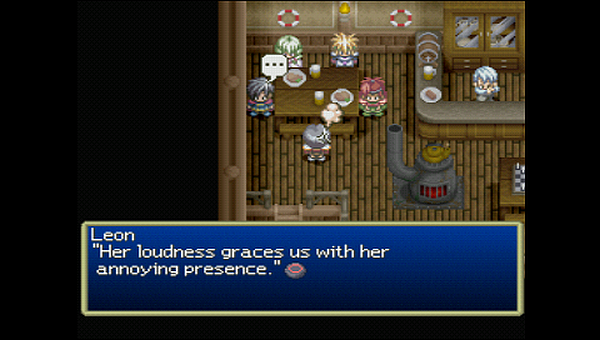 Stahn is joined by some interesting characters who make the long adventure a joy. My favourite is Rutee, a short-haired tomboy of a girl. She and Stahn don’t start off on the best of terms, as her short temper doesn’t go well with Stahn’s stubborn honesty, nor with his love for sleeping late. This is naturally a basis for many hilarious exchanges between them. But one can guess that, as they overcome many dangers together, the two start getting along better. Philia, another prominent girl in the party, is a priest in service of the goddess Atamoni, one who has lived her life sheltered from the outside world… Until she decides to go with Stahn and his friends, and this opens her eyes about so many things she didn’t understand before. Another awesome character is Leon, a young, but already famous warrior from the kingdom of Seinegald, regularly sent on all kinds of errands by the king. He and Stahn form somewhat of a rivalry which develops nicely alongside the overall story. Despite his arrogant appearance, Leon is a rather introspective fellow. He is considered a man of extraordinary strength, and, when he realises that Stahn actually has comparable battle skills, he develops considerable respect for him, despite being too proud to ever show it. Other cool characters Stahn has the pleasure to have in his party are Rutee’s mysterious friend Mary who has lost her memory, the experienced archer Garr, and the Fitzgald gladiator Bruiser Khang (an optional recruit). 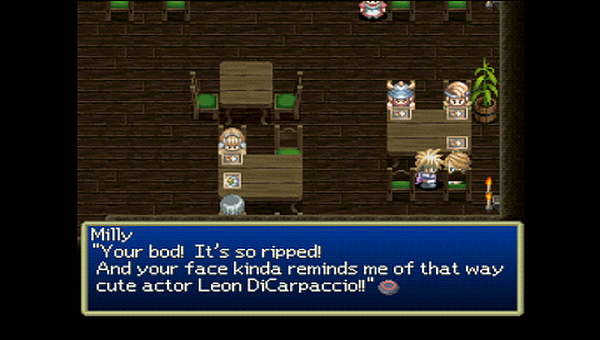 Some NPCs also add a lot to the game’s charm. 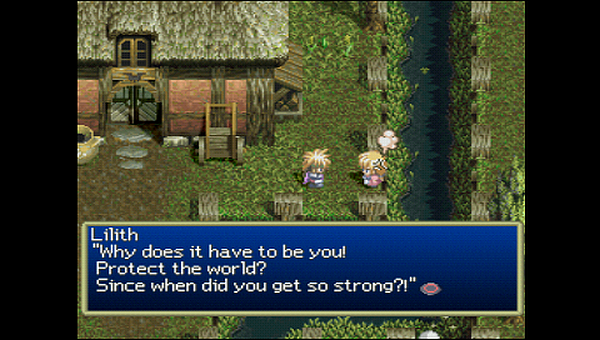 Stahn’s sister Lilith and grandpa Thomas (a former warrior of some renown, of course) are a wonderful family to have. Leon’s sweetheart Marian is a tender and thoughtful woman. Seinegald’s finest scientist Doctor Otto is just crazy… Oberon Corp’s president Hugo, and branch managers Ilene and Baruk are people with impressive vision for the world’s future… As far as villains go, the game doesn’t offer much, sadly. The main baddie is as generic as you can imagine. But that’s the sole negative when it comes to the cast. Tales of Destiny is essentially a SNES game… I haven’t played the first Tales that actually WAS on SNES, Phantasia, but a quick look on YouTube confirms that it wasn’t too different. Of course, Destiny is far more polished and offers a lot more in terms of pretty much everything, but the gameplay differences aren’t big. You move around town in the traditional top-down view, you enter houses/shops, you interact with people… Leave the town, and you’re on a world map where you can travel on foot, by ship or, very late in the game, by airship. When on foot, you can be stopped at any time by random battles. The majority of battles in Tales of Destiny are of the random variety, but there are also multiple areas where you can actually see and often avoid the enemies on screen. 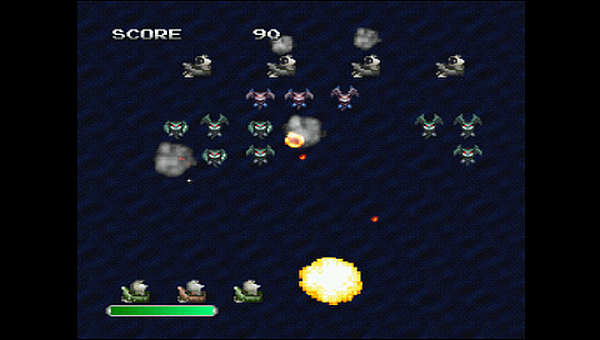 Occasionally, that’s even worse than random battles because a bunch of enemies can surround you and you must fight a few in a row (and escaping does not make the on-screen enemy disappear…), but usually it’s a good thing. I found myself willing to fight as little as possible… And not for the reason you imagine. You see, Tales of Destiny is easy… Very easy! My first game over was in a Galaga-like mini-game more than halfway into the game… And my first game over in battle was near the end of the game. Your party is simply incredibly powerful and defeats everything in its path with absolute ease. About 30-40% into the game, this because too apparent, and I tried to escape from as many battles as I could until the end, hoping that staying at relatively low levels would increase the challenge… It probably did, but not nearly enough. It’s hilarious because even the story acknowledges your immense power – albeit probably not on purpose. This isn’t really a spoiler – right before tackling the final dungeon, the characters have a talk… And they discuss what they’ll be doing after the world is saved! There’s hardly a hint of doubt in their success. That said, battles are fun because, unlike most RPGs, in Tales, it’s like you’re playing a 2D fighting game. You only fully control Stahn, but, particularly about using spells and recovery items, you can also give orders to the rest who may or may not listen (they often do). You can attack in several different ways – normal slash, low thrust, high thrust, jumping slash, jumping downward thrust. Stahn also learns several fun special attacks as he levels up – launching a projectile, a spinning jump attack that hurts aerial enemies badly, an air-to-surface combination of kicks and slash, etc. You match these to a direction and execute them by pressing it + the X button, but near the end of the game, you can even get an item that fully removes the border between RPG and 2D fighting game by letting you execute all special moves you’ve learned (not just the 4 you have mapped) by typical fighting game input like F, D, DF, X. You can also pause the action to select a spell or item. Those take a little bit of charging to use, and if you get hit (or hit an enemy while he’s charging), the command is cancelled and must be selected again. There’s really not much to add about fighting – boss battles are more challenging, but never particularly difficult if you pay attention and heal enough. The final boss can do a half-glitch, half-trick which makes him practically auto-win, but redo the battle a few times at most, and it won’t happen, letting you win with ease. Aside from fighting, another fun aspect are the multiple side quests and mini-games you can play. I must admit I didn’t get too deep with those, but one I did complete that I must say was quite unorthodox was a 50-question quiz about not only Tales of Destiny, but also previous Namco games. That was cool and informative. Apparently there are also port warehouse mini-games where you move crates around and find treasure chests. Speaking of moving crates, the ability to move some objects around is the main source of puzzles in Tales of Destiny. There are a bunch of them, and you will have to complete them to advance the story at certain points. 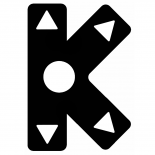 Here’s the place to mention that there is also a broken puzzle at one point. This one is about words, not moving things, and is the translator’s fault. After getting stuck unable to solve it, a quick google for “Tales of Destiny puzzle bug” showed the problem, and then I specifically looked up a playthrough of the Japanese version on Nico Nico Douga, and I solved the puzzle properly there. There is another puzzle where the game doesn’t tell you what you must do AFTER you solve it, and there is no indication that you’ve actually solved it until you do that thing you’re supposed to do. I’m not sure if this one is due to a translation problem. Aside from these two, though, you’ll have no issues with story puzzles. 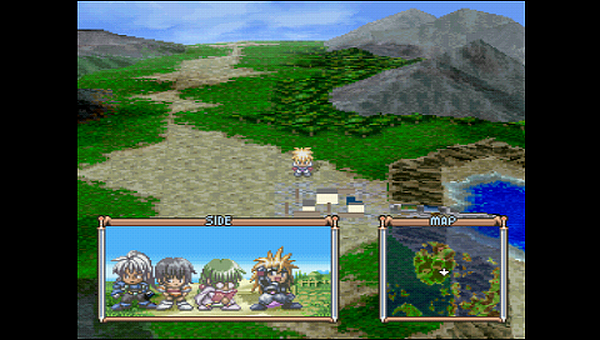 As already mentioned, Tales of Destiny looks like a more polished 16-bit game. That’s not a bad thing in the days of early 3D graphics which don’t hold up too well today. Tales of Destiny is a pleasure to look at. With the exception of the character art found on the menu, character models are very stylised, with big heads, and they all look like children. This is especially prominent in battle, and I think it’s a prevalent artistic direction in the Tales series. The world is beautiful, with different areas ranging from snowy forests to deserts. The background decoration in dungeons and the like leaves a lot to be desired, but, on the other hand, houses are full of different objects that even politely give you a description if you check them. 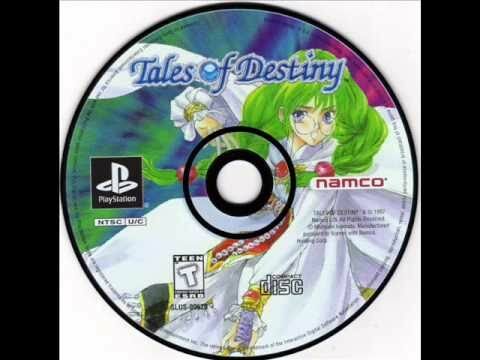 The soundtrack of Tales of Destiny is a mixed bag. Lots of it is forgettable, but the handful of good songs are REALLY good. In my experience, I find this to be typical Motoi Sakuraba fashion. There are of course happy and sad songs, upbeat and slower tunes, depending on the occasion you’ll hear them on. The song I liked best was the sad song playing in most towns when things get really bad in the world. It’s appropriately called “Despair” and has an excellent acoustic guitar section. 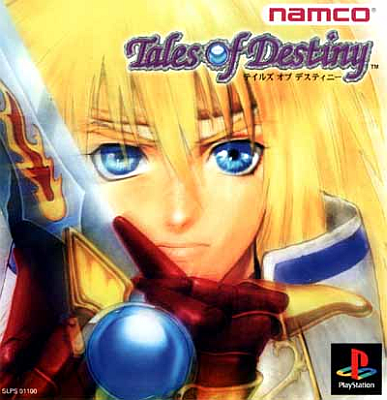 I recommend Tales of Destiny to people who are looking for a light-hearted, easy game. RPG fans who are a bit starved for the classical feel of the genre, the strong fantasy setting, the fairy tale atmosphere. There is no depth to be found in the story, but there are wonderful characters you will grow to like. Stahn is such a cliché of a good guy it’s almost surreal – I felt they couldn’t have made such a goody two-shoes character if they tried. In spite of this, he is so easy to relate to. He works incredibly well as a non-silent protagonist because he has actual personality, an unlikely one, but pretty much impossible to dislike. 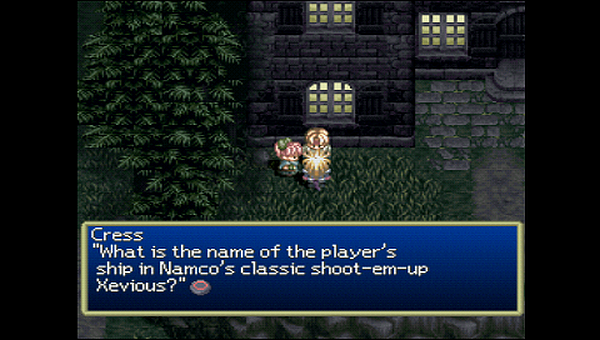 This contrasts strongly with Square’s protagonists of the period when Tales of Destiny came out, the late 90s. Yes, Tales of Destiny is a breeze, the biggest challenge coming from a couple of broken puzzles as opposed to the boss fights… But the variety of things it offers on the side in the form of mini-games and side quests, as well as weird, yet adorable additions to the main quest like the Galaga mini-game I mentioned, compensate for that. Maybe it’s a bit longer than it rightly should have been, but, at around 50 hours, it’s not that long for an RPG. Overall, it’s not a particularly memorable experience, but it’s one of those games that warm your heart and give you a healthy dose of optimism.